WIN a fresh meat scholarship! Will you be joining us for our next fresh meat intake on Sunday June 30th? What if we told you that you could win a Newcastle Roller Girls scholarship and attend the whole 15-week course for FREE?! One lucky skater will be given 100% free entry and skate hire – worth a princely sum of £97.50! – for the whole course which will teach the skills necessary to start playing roller derby. After passing the 15 week course the lucky winner, along with his or her talented fellow trainees, will be admitted to the intermediate sessions in Newcastle Roller Girls OR Newcastle’s men’s roller derby team Tyne & Fear Roller Derby (yes, this is open to men too!) where they will continue to work on their skating with an aim to pass the 2013 WFTDA Minimum Skills requirements and play in public bouts! Are you over the age of 18, or will you turn 18 before Sunday June 30th 2013? Can you skate confidently on quad roller skates indoors? You don’t need to be a whizz, but you need some basic skating experience as our fresh meat course isn’t suitable for first time skaters. Are you available on Sunday mornings 10.30-12.30 from June 30th – October 6th this year? And can you attend our next home bout, Jailhouse Block, on Saturday June 29th at Walker Activity Dome from 11.45am until 4.00pm? Are you fit and healthy with no conditions or injuries that would stop you from playing a contact sport on roller skates? If the answer to all of these questions is a hearty YES, then you’ve got nothing to lose, and the whole new exciting world of roller derby to gain! As previously mentioned, this prize is open to male and female skaters, and of course anyone who has previously attended Newcastle Roller Girls fresh meat sessions are most welcome to enter. To enter, all you have to do is email NRG coach and fresh meat co-ordinator Big Smack & Fries at bigsmackandfries @ gmail.com with the subject “NRG Fresh Meat Scholarship” with your full name, date of birth and a contact telephone number, before 5pm on Friday June 28th 2013. It’s really that simple! You’ll receive an email back to confirm we’ve got your entry, then the winner’s name will be drawn from a hat or similar receptacle at the bout on Saturday June 29th and will be announced on this website and our Facebook and Twitter accounts. ENTRIES ARE NOW CLOSED – ANY EMAILS RECEIVED NOW WILL NOT BE COUNTED! Best of luck to everyone who entered. We wish you the best of luck and hope to see you at our fresh meat intake regardless of whether you win the scholarship or not – make sure you grab a programme at Jailhouse Block anyway, as there’ll be a voucher that everyone can bring on June 30th to get the first session and kit hire for free at least. The scholarship prize is valid for the upcoming fresh meat intake only, beginning on Sunday June 30th 2013, and may not be ‘saved’ to be claimed at a later intake. The intake will run on Sunday mornings at Walker Activity Dome at 10.30-12.30 and is scheduled to end on Sunday October 6th but this is subject to change, sometimes at short notice. In order to win, contestants must enter by email before 5pm on Friday June 28th and be present at our bout Jailhouse Block on Saturday June 29th at Walker Activity Dome between 11.45am and 4.00pm when the winner will be announced. The winner will be selected at random, and there will be only one scholarship awarded. If the first selected scholarship winner decides they no longer wish to claim the prize, they must notify Newcastle Roller Girls, who will then select another winner at random – the prize cannot be given as a gift by any winner to somebody else. Personal information received by Big Smack & Fries (real name Alice Robison) as part of your entry to this competition is used solely to ensure your eligibility to attend the course and will not be shared with anyone else, both inside Newcastle Roller Girls and otherwise. The scholarship winner will be held to the same standards as all of our fresh meat skaters: s/he must be competent moving around on quad roller skates at the start of the course as we do not teach skating from scratch. If a non-competent skater wins the scholarship, it will be redrawn and awarded to another entrant after assessing the original winner’s skating at the first session. The scholarship winner will be tested at 5-weekly intervals with the rest of the intake and should s/he not pass the week 5 or week 10 skills test s/he will not be able to continue with the intake. Any remaining sessions that the scholarship winner is not eligible to attend due to failing a test may not be claimed for a later intake, this is a one-time prize only! Due to the full contact nature of roller derby, the scholarship winner and all other fresh meat skaters must be over the age of 18 on Sunday June 30th 2013. If the prize unwittingly goes to an underage winner, it will be redrawn. 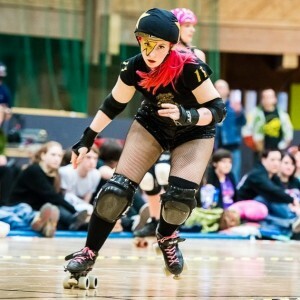 Similarly, all fresh meat skaters are required to sign a waiver declaring that they are fit to play roller derby, and if it transpires that the scholarship winner has an undeclared health condition or injury that means they cannot be accepted, the scholarship will be given to another entrant. For safety reasons and for the benefit of all attendees’ progression, we ask that all of our fresh meat skaters miss no more than 3 of the 15 sessions in the intake. If the scholarship winner should fail to attend 4 or more sessions, s/he will not be able to continue with the intake regardless of having won the competition. While this prize does include free skate and kit hire for the duration of the 15 week course, all skaters are expected to invest in their own equipment from an early stage in the intake and will not be allowed to borrow kit upon completing the intake, paying or not. We will not accept fault or quality of borrowed equipment as an excuse for not passing a test (we only offer basic ‘roller disco’ style quad skates) so it’s in your best interests to at purchase your own skates and safety gear when you can. If you have any questions about the scholarship that aren’t answered above or on the fresh meat intake’s official Facebook event, please drop our fresh meat co-ordinator Big Smack & Fries an email at bigsmackandfries @ gmail.com and she’ll be more than happy to help!